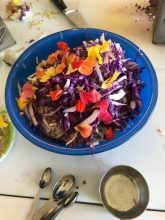 If you missed out on the Kimchi party at the Women’s Health Resource Library last week-end, we are delighted to share the information and recipe. Follow our directions and find out why Kimchi is all the rage. Hold your own Kimchi party with friends and family! The ratio is about 5 lbs shredded vegetables to 3 Tbls salt. Size this up or down for whatever container you’re using. Approximately 1 ¾ pounds vegetables fits into a quart jar. Traditionally kimchi is made with Chinese cabbage but you can also substitute regular cabbage if you don’t have the Chinese version. Dissolve at a rate of 2 TBSP sea salt to 1 qt water. Add to jar, if needed, to bring liquid above level of veggies. Leave one inch space from top of jar. Combine all ingredients into a large bowl and pound or massage using clean hands for 15 minutes with a potato masher or wooden pounder until juicy. Pack into a quart jar leaving one to two inches empty to the top of jar. There should be juices visible above the top of the cabbage in the jar. If this is not the case, return to bowl and pound again or add brine to bring juices above cabbage using recipe below. Put lids on, label, and leave out at room temperature for at least 3 days. At this point, you need to mature the sauerkraut. You can start eating it right away but, generally sauerkraut takes a little while to be really flavorful and fermented. You can age it in the refrigerator or at room temperature. At room temperature aging will take days or weeks and in the refrigerator it will take weeks or months. Every sauerkraut/kimchi you make will be different, but generally you’re looking for tanginess, sour taste, and a softened texture. Sauerkraut also has a tendency to lose moisture over time. This is something you need to be aware of. Using the brine recipe of 2 Tbls salt to 1 qt. water to keep the liquid above the cabbage at all times ensures that you will be eating this sauerkraut for many months to come. MONITOR: Put your jar out on the kitchen counter so that you’ll see it every day and can check the progress. Monitoring is the most important thing to remember to do when your jar is fermenting! BUBBLES: Your jars will get bubbly and be full of liquid—this is okay and good! It means they’re fermenting! TEMPERATURE/TIME LENGTH: Generally you’ll keep your jars out to ferment at room temperature for at least 2-3 days and up to a week or longer. During the period that you leave your jars at room temperature, you will need to keep an eye on them because once the fermentation process starts you will need to monitor the progress. If the temperature is very warm (above 70 degrees) you may need less time at room temperature. If the temperature is cool, you’ll need more days. Taste them. If they taste good, tangy, and have softened some, they’re ready to eat and can be stored in the fridge. RELEASE PRESSURE: You will need to release the pressure that gets built up during this warm period of rapid activity. To do this, open the lids and let out the air that builds up. This is normal, and you will have to do it for every jar that you make at least once a day while they are at room temperature. If you neglect this step, the jars could crack or worse explode! PUSH DOWN LIQUID: Another good thing to do when you open the jars once a day is to take a fork and push down the vegetables if they’ve risen up. This helps them stay under the juices and aids the fermentation process. 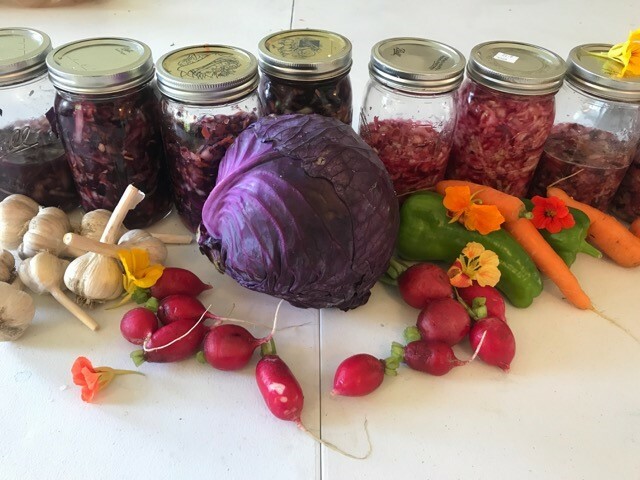 If there is not enough liquid to cover the vegetables at the top after you open the jar and push them down, you should add brine to cover (see brine for sauerkraut recipe above). SKIM ANY MOLD: You might find a little mold on the top of the jar of the ferments. Don’t worry, this is okay and normal—just skim it off. The fermented vegetables inside are still good. Sometimes something goes wrong and the ferment will smell and taste bad. Don’t worry; you won’t want to eat it anyway, but it won’t harm you if you do. Really clear and well explained with lots of great recipes for veggies, drinks, dairy, etc. 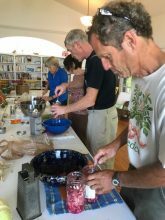 Great resource for beginners with a focus on small batches in jars. 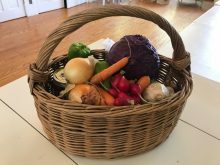 Recipes courtesy of of Ripley Organic Farm, Dover-Foxcroft, Maine.